They sure do love their coffee in Italy —it’s almost impossible to picture Italy without those small white espresso cups somewhere in the scene. To celebrate Italian coffee culture, we thought we’d take a look about the history and culture of the humble bean in this coffee-adoring country. Espresso is regulated by the Italian government because it is considered an such essential part of Italian daily life. Coffee is often drunk quickly, standing up at espresso bars in cities across Italy. If your order “un caffè” in Italy, you’ll receive a shot of espresso. Coffee was first introduced to Europe from Egypt through the Italian city of Venice, where a flourishing trade between the local businessmen and Arabs enabled a large variety of commodities and goods to be imported, including the precious new commodity that was coffee beans. The first “caffe” reportedly opened in Venice in 1683, and soon became synonymous with comfortable atmosphere, conversation, and good food, adding romance and sophistication to the coffee-drinking experience. It was two Italians who came up with that we know today as the espresso machine. First, in Turin, Italy in 1884, a man by the name of Angelo Moriondo lodged a patent for a “steam-driven instantaneous coffee beverage making device.” This patent is considered by many to be a precursor of the espresso coffee machine. 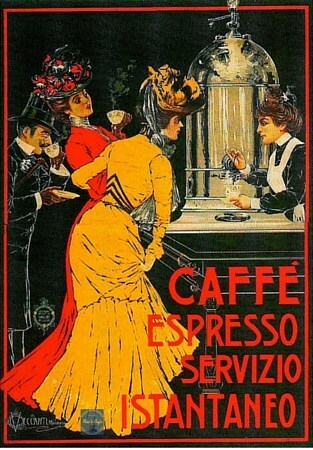 Then, in 1901, Milanese manufacturer Luigi Bezzera came up with some improvements to the espresso machine. He patented a number of these, the first of which was applied for on the 19th of December 1901. It was titled “Innovations in the machinery to prepare and immediately serve coffee beverage.” Bezzera was said to have come up with the idea in order to reduce the amount of time his factory workers spent on their coffee breaks! An estimated 14 billion espresso coffees are consumed each year in Italy, and Italians consume approximately 8 pounds of coffee per capita, per year. This entry was posted in barista, beauty, Beverages, brewed, Cafe, Coffee, espresso, GBYD, Gourmet, GourmetLivesMatter, nation, raezcafe, Wellness and tagged barista, beverages, brewed, cafe, coffee, espresso, GBYD, gourmet, GourmetLivesMatter, nation, raezcafe, wellness. Bookmark the permalink.